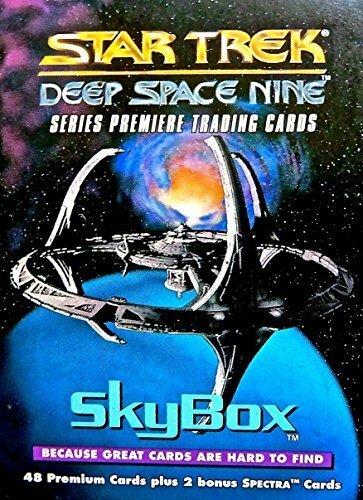 1993 - Paramount / Skybox International - Printed in U.S.A - Star Trek - Deep Space Nine - Limited Edition - Series Premiere Trading Cards - 48 Collectible Card Set plus 2 Bonus Spectra Cards - This is the very first Deep Space Nine trading card line, detailing the story of the exciting Series Premiere - Two unique dimensional SPECTRA Cards - A Certificate of Limited Edition - New / Mint Condition Factory Sealed - Hard to Find - Fantastic Collectible for the serious collector! - - Hard to find in such great condition - The photo you see is of the item you will receive! We do our own photography and never use stock photos! Each item is hand wrapped in special shipping paper, and hand packed in a new shipping box with new fill. - Ships USPS Priority Mail, Insured with Tracking Numbers - Signature Required on orders over $20.00 - Please ask questions before purchasing, we are always available to answer any and all questions a customer may have about a product.